You might know the brand Serta from the popularity and fame of the name in the mattress business. They have taken that same expertise in comfort and support and applied them to the office chair environment. What this results in is one of the most comfortable and health focused chairs on offer. Many people attribute long sessions of sitting at their desk to a number of back and neck ailments. Serta went about designing a chair to combat these issues, and when you first see this chair, you’ll fully appreciate how they achieved that. At first appearance, this is a very large chair, and it is. It weighs a hefty 51 pounds, but that weight is put to good use to ensure your comfort. Supporting a body up to 250 pounds, a large cushy seat and backrest make sitting a pleasure. The seat measures 26 inches wide by 28 inches deep, and the entire chair occupies a space only 2 inches longer in each dimension. While the height of the chair is adjustable, the range is just 2 inches, bringing the top of the backrest up from a minimum of 28 inches to a maximum of 40 inches. The armrests on the other hand are adjustable by up to 4 inches, putting them at over 29 inches above the ground, or 25 inches at their lowest. The seat is supported by a heavy-duty base that is coated in a light high gloss finish, and perched on a set of five large caster wheels. 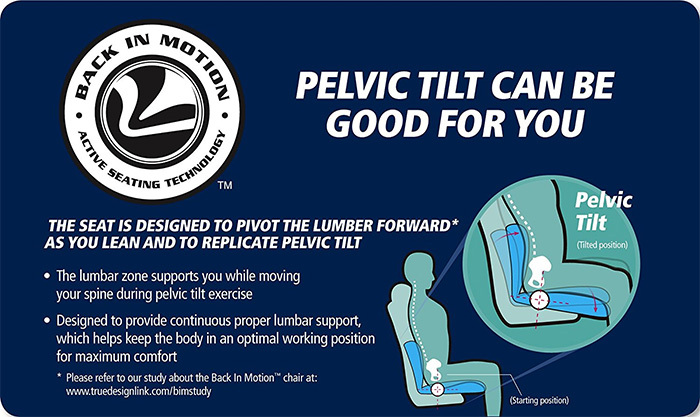 The biggest feature of the Serta 44186 (and Serta 44187) is its back in motion active seating technology. This technology makes use of a specialized inner seat to provide continuous lumbar support regardless of your sitting position. Think of it as a chair within a chair. 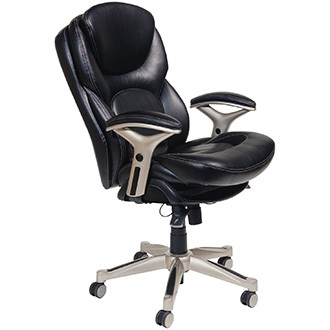 The lumbar support provided is fully customizable and contoured to ensure constant support. Deep layered body pillows adorn both your seat and backrest, reducing pressure and providing a superior seating experience. All this is covered in a smooth eco-friendly bonded leather. While not as effective as a pure mesh setup, comfort cannot be compared, and an innovative design still provides enhanced breathability and airflow. Further customization comes in the form of the arm rests. Often fixed in position in other products, the Serta offering can be adjusted quickly and precisely with the stylish push-buttons located on the arm rest. Due to the chairs advanced design, tilt and height adjustability levers are presented in the form of cable activated paddles on either side. They work just as easily though, actuating the pneumatic lift and tilt lock features. While the chair may look a bit over top, and one could even apply the term kitsch to it, it is all done in the interest of your health and improved long-term comfort. Serta guarantee the chair for one year and offer it at a surprisingly competitive price for all of its features. If you are plagued by backache, or even just want to avoid that ever being a factor, you should certainly consider the Serta 44186 office chair.